P.T. Barnum published both fiction and non-fiction over the course of his career. His autobiography he published, and republished, from 1855 to 1888. In addition, he authored ‘self-help’ books including "The Art of Money Getting" and "Dollars and Sense", which focused on lesson he had learned through his years of business. "Humbugs of the World" is his famous history of tricks and tricksters. His work also included a number of young adult books meant to entertain and educate youth on the wild animals in P.T. Barnum’s menagerie. "Lion Jack" and "Jack in the Jungle" are adventure stories of a young man in search of exotic animals in the wilds of Africa. "Forest and Jungle" was written by Barnum to be a new type of textbook seeking to ’trick’ students into learning through engaging imaginations. P.T. 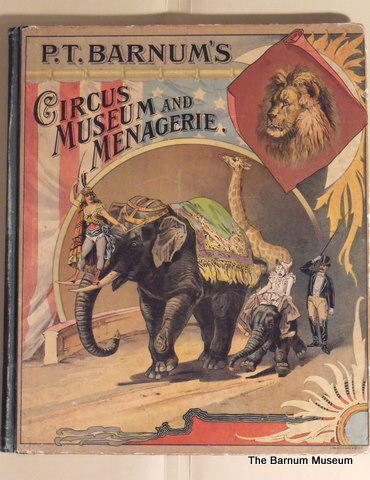 Barnum, along with children’s author Sarah J. Burke, published a series of three picture books featuring his museum, menagerie, and circus. The lithographs used to illustrate the books were done by the Strobridge Lithograph Co. who famously did the Barnum & Bailey Circus posters in the late 1800s. This trilogy included "P.T. Barnum's Museum", "P.T. Barnum's Circus", and "P.T. Barnum's Menagerie". A later edition combined all three books. A copy of this edition was donated to the Fairfield County Historical Society by P.T. Barnum himself. While it remains to be seen if Barnum actually penned this book, Ms. Burke would not publish her own work, "Fairy Tales for Little Readers" which included a rewriting of the 'Little Thumb' fairy tales, until 1894.